Since the first application of wallpaper, cultures have changed, style has ebbed and flowed, and modern design has evolved. Whether we fit our entire home from floor to ceiling with it, or simply feature one space, wallpaper has remained one of few long-standing design elements. To best appreciate what wallpaper does for design, we want to look at its bright and colorful history. We can also learn how to knit together design elements of the past into modern spaces. Though there was much to be said about leaving England behind, the colonists were challenged with abandoning the customs and comforts of decorating their homes. 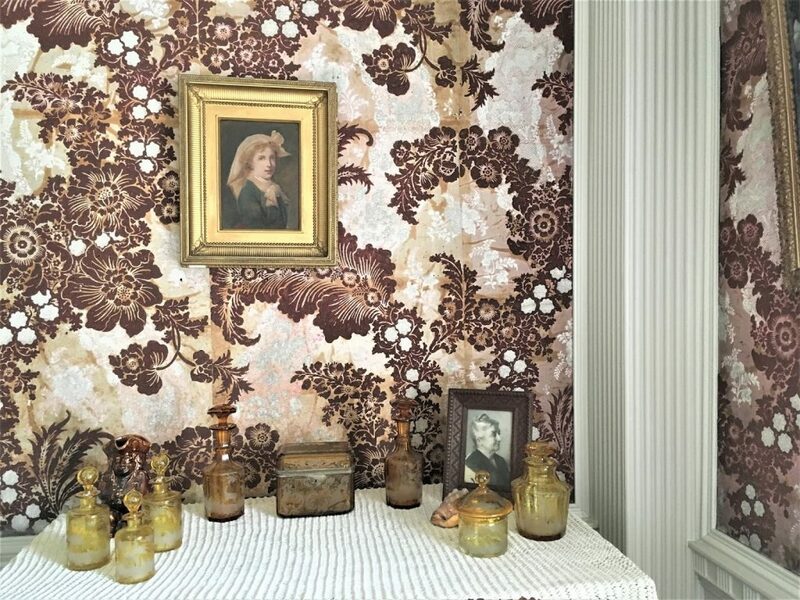 Since then, wallpaper has been a commodity in American homes. Wall coverings were a fashionable English commodity that only the wealthy in America could afford to import and install. They were created almost exclusively to do just that- cover the walls. At first glance, our New England colonial homes appear the same as they did back then. Yet there are many modern day luxuries in the building process today. Wood-and-clay walls of early America pale in comparison to our smooth, solid walls. Wallpaper catered to truly finishing our homes. These papers were as rudimentary as the New World itself. Assembled and printed by hand, wallpaper production was slow and inconsistent, yet always in high demand. 18th-century flocked wallpaper preserved at Sarah Orne Jewett House in South Bernwick, ME. 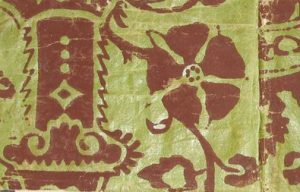 Fun Fact: Decorators in the 1700’s pioneered the application of velvet to the surface of a paper for beautifully textured patterns, AKA flocking. 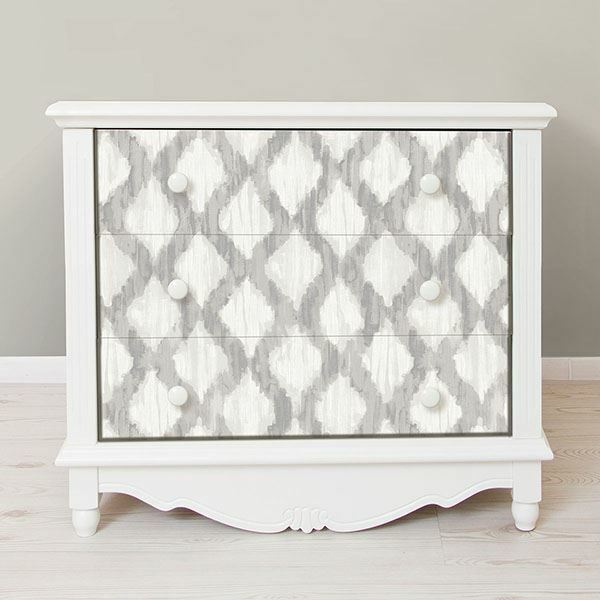 Flocking is still among our designer favorites today! Another popular pattern that we still see often is small print florals, or formerly called “sprigs”. The little groupings of soft colored flowers yielded enough dimension without the gaudiness of flocked patterns. This time in our country’s history shows increased aspirations for designing homes (we can thank the abundance of design books that were published then). Design principles were now available to all people, not just the well-to-do. We see quite a bit of plain colored papers, most commonly used in lower- middle-class homes. However, as the wallpaper of old became open to anyone, the high-end patterns and papers advanced even further. divide the wall into three sections–dado, fill, and frieze–to be papered with different but coordinated patterns. French arabesque and English neoclassical were popular among the wealthy due to the intricacy of the patterns. Since machines produced most of our papers then, we could have almost any color and print in style. Neoclassical and arabesque patterns were often printed with bright colors on a pastel background, and landscape figures- small pastoral vignettes repeated in rows of two or three separated by vertical stripes. Towards the end of the 19th century, interests shifted from the traditional neoclassic trend to Gothic Revival and Arts-and-Crafts principles. You see these styles in many turn-of-the-century homes, with their bolder colors and large prints. 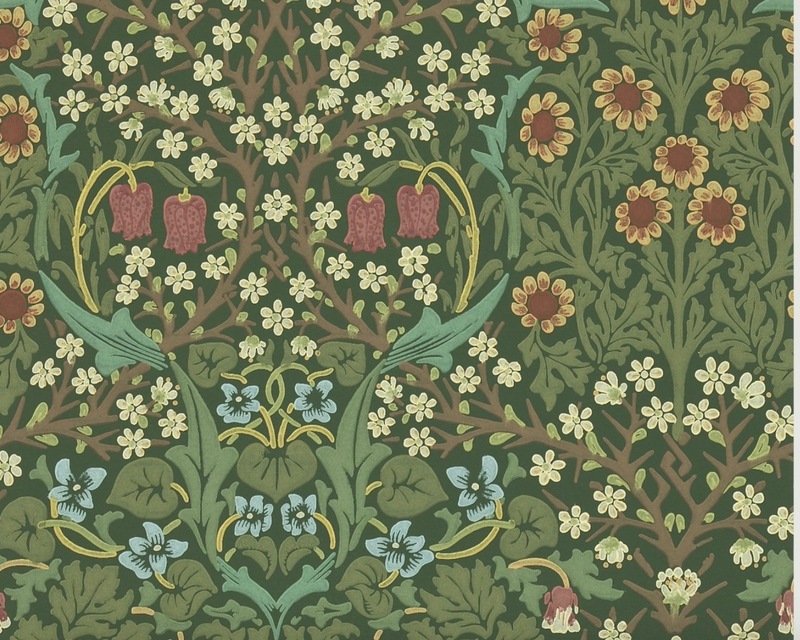 William Morris’s iconic floral patterns with rich color ways made quite the statement then and continue to do so now. Fun Fact: Zechariah Mills, (Ct, U.S.) was the first in the industry to stamp and number rolls of wallpaper to protect his designs. This is how our modern system of uniquely numbering patterns started. While we moved into a new century, design basics remained for the average consumer. Every wall and ceiling in the house was covered in coordinating papers. Benefitting this approach to decorating was the publication of our first wallpaper catalog books! Similar to the ones you’ll see today, these books easily gathered the newest wallpaper options for people like you and me to bring home and mull over. We also see the first applications of a modern favorite- textures. The plain neutral tones shown suggested that textured wallpaper could introduce a richness and warmth to a room that was unmatched by painted walls. World War II drastically affected the wallpaper industry. Our favorite decor medium was deemed non-essential by the War Production Board and halted almost all new production of wall coverings until 1945. Home design booted up again mid-century with vibrant, machine-age colors, vinyls, abstract geometrics, and oversize tropical leaves . Books catered to specific rooms (kitchens, bedrooms, powder rooms, etc) started making appearances later in the century, as well. The mid-century resurgence in popularity formed many of the top notch wallpaper companies we have today. Filled with contemporary designers and devoted historians, we see thousands of new patterns yearly, on top of classic reproductions! 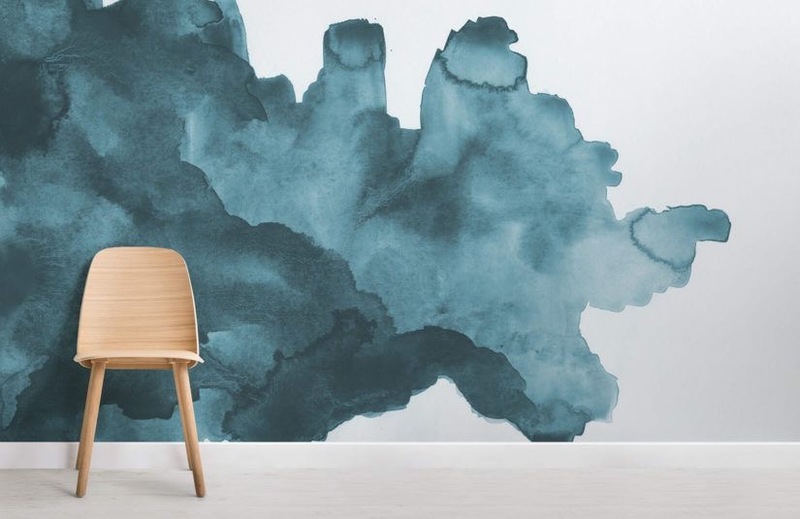 Wallpaper murals are trending high in design right now. 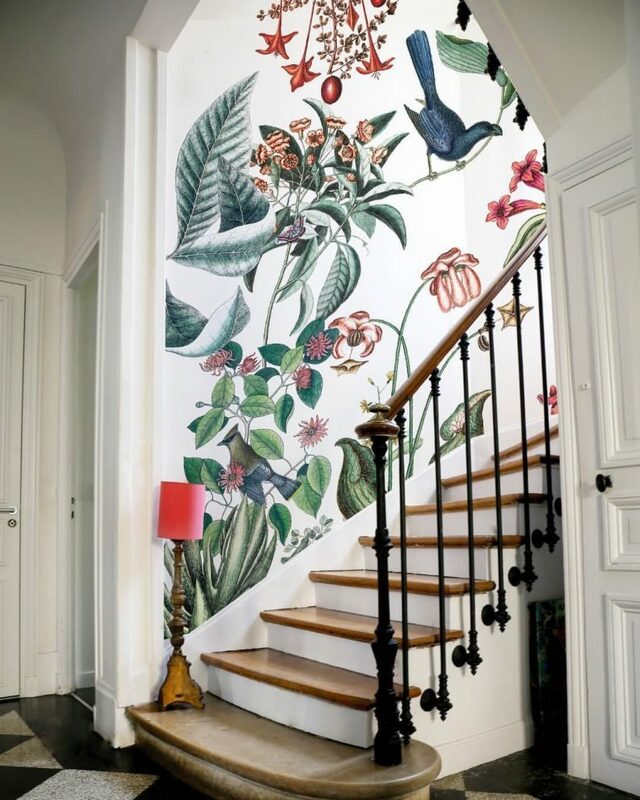 Like the one in the staircase to the right, murals enhance a space in a way paint or standard wall coverings can’t compete with. They say “what goes around comes back around.” And that is absolutely true in wall coverings. 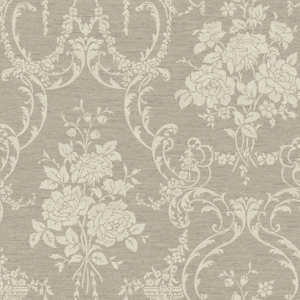 Contemporary wallpaper is a perfect combination of our designs of the past. With neutral backgrounds, we have the simplicity of early papers and the funky hues from it’s heighth in the mid-century. This fall, let’s freshen up our decor for the upcoming holidays. 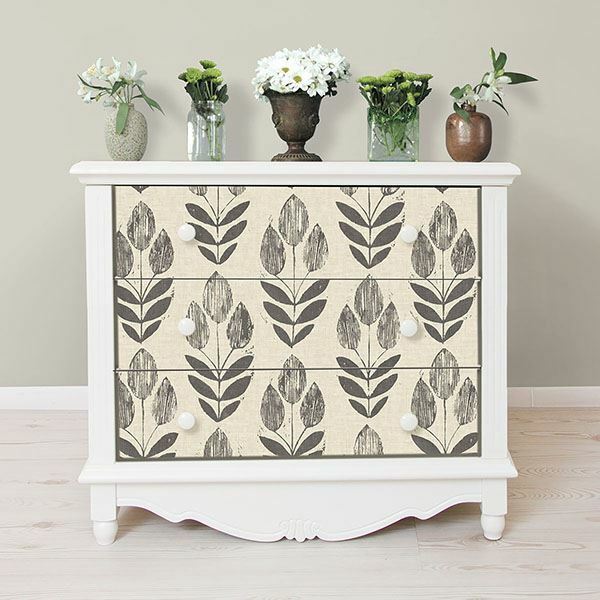 Applying a patterned wallpaper to the face of a dresser is certain to give any room the attention it deserves. Wall Pops‘ Peel & Stick wallpaper makes it easy and temporary! Never worry about leaving behind residual wallpaper glue or damaging the surface you’re working with. Watch the tutorial here. As promised to our VIP email subscribers, we have another DIY to share with you this month. We’re sticking with our theme and giving you another out-of-the-box way to use wallpaper. For a more subtle approach to accent walls, apply a fun wallpaper on the inside of cabinets or bookshelves. 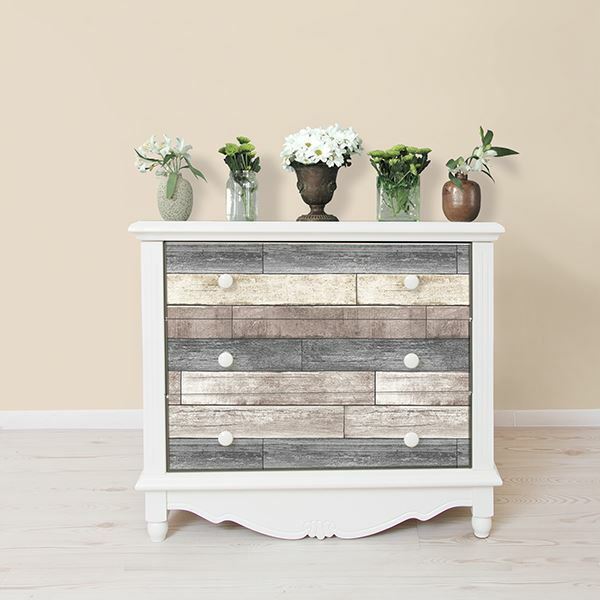 This design tip lets you have a little touch of color and you don’t have to worry about overwhelming your space. 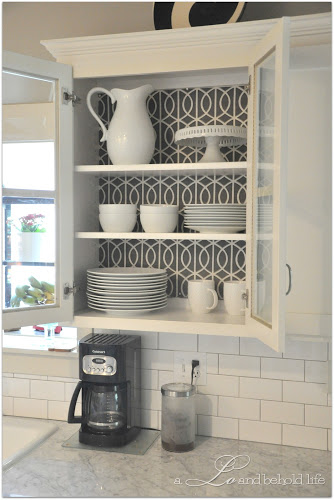 You can use wallpaper as a kitchen drawer liner also! Until next month, happy paper hanging!